Got Work Worries? Alarm.com For Business Can Help. The good news is that most business owners get better at managing work worries over time. You can too—especially with new technology like smart business security on your side. 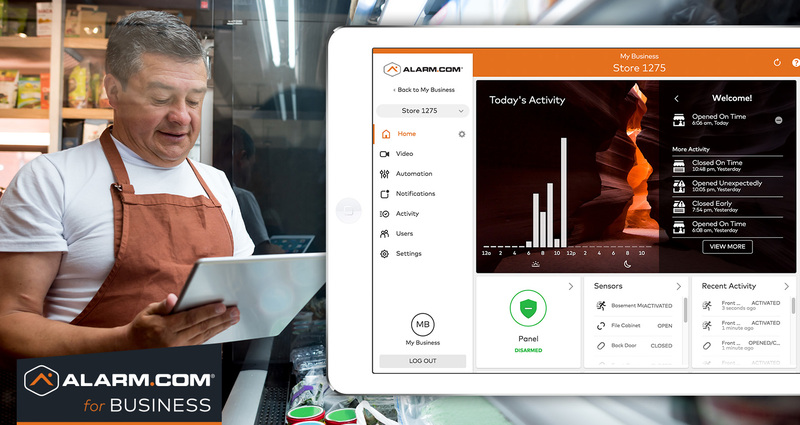 Security worries: Unlike old security systems that only work after something bad happens, Alarm.com for Business protects your people, premises and inventory around the clock. Waste worries: Alarm.com Smart Thermostats help you keep energy bills under control with an easy Away mode that turns down your heating and cooling automatically when no one's there. "What's happening" worries: With smart business security cameras giving you a direct line of sight to your business, it's easy to see what goes on when you're not there. Time worries: With smartphone control at your fingertips and new solutions to everyday problems—like our keyless access control solution—Alarm.com makes it easier to get more done. Want to tackle your work worries with Alarm.com? Professionally delivered by authorized service providers Alarm.com for Business is the all-in-one solution for smart business security, access control, smart video monitoring and energy management. Our technology helps you tackle everyday work worries and focus more on running your business.